Perry Block - Nouveau Old, Formerly Cute: But I’m Not Gay! Y' know, not half bad! These days I’m trying to figure out how I want to look as an older guy. You see, I’ve begrudgingly begun to accept the fact that I have more than entered the “post-cute” phase of my existence here on the planet. I simply no longer have it within my power to be cute! I can’t affect cute, I can’t imitate cute, I can’t in any manner conjure or implore cute. True, I can think cute and I can even act cute, but I can never again BE CUTE! So, I’m spending an inordinate amount of time checking out plus 60 year old guys in an effort to figure out which one among them whose looks aren’t liable to cost anyone their lunch I may best repackage myself into resembling. It’s a daunting task. And when you tend to spend your time staring intently at a lot of men, well, some may quite naturally think you’re looking to find a partner for Sunday brunch with waffles and ice cream followed by an afternoon of antiquing. 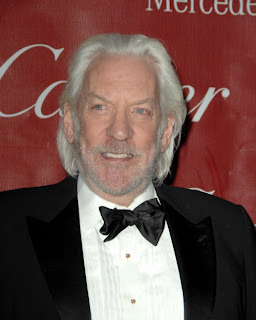 “That’s not a bad looking man,” I thought to myself the other day while staring excessively at an older dude who looked a bit like the actor Donald Sutherland. Yep, distinguished gray beard, professorial look, and I think … uh … he just winked at me! Wondering how I might look in a very gray beard, I realized I’d probably more closely resemble Roy Rogers' sidekick Gabby Hayes than Donald Sutherland. “Oh, uh, hi,” I said. “I have to tell you I’m not gay. Didn’t want to disappoint me? No, Hawkeye, I only want to resemble you, not ride you like a steer! A bit later, I began scrutinizing a rather regal looking oldster with intriguing facial structure a la a less dissipated Malcolm McDowell. He gave me a quizzical look, then a smile. “I’m not gay,” I assured him as he sidled on up to me. “I just wanted to see if maybe I could affect cheekbones like yours with a bit of make-up." “Oh … oh... good," I stammered. Not that there’s anything wrong with that! Uhh, umm ... meeting any nice gay guys?" "I'm flattered you want to look like me," he said, "but you shouldn't worry. You look just fine." Not only did he turn out to be a very nice guy, he even let me take his picture so I could review it later with my stylist. I hope he meets a lot of nice gay guys going forward. Frankly I’ve just got to get better at all this surreptitious scrutinizing. Or maybe just accept the fact that however I look is how I’m gonna look? Hey, check out that guy over there! Looks like the older Cary Grant! But, of course, I'm not gay! Hmm. Wonder if he’s a good dancer…. ULP! Did I say that? Thanks for your comment, Linda! Mirrored sun glasses, that's what you want. Not to look cool, but so all these guys won't notice you staring at them. But I'd also look cool, right, Lexi? I said isn't that right, Lexi? Perry, this post was just the cutest thing! I thought I was the cutest thing! Of course you'd look cool in mirrored sun glasses, Perry. Saturnine and mysterious, too. Yes, it goes without saying, Lexi. But the saying's always nice! Sheesh. You're right, I totally forgot that you are the cutest thing. In fact, if you and I were in a cute contest, we'd probably tie for the title. Well, there's Sean Connery, and Paul Newman. They looked quite distinguished at 60. You don't want people to call you "cute" when you're not eight years old. Oh, then there was Derek Jacobi at 60. Derek Jacobi is gay?! I loved him in "I Claudius." I mean, his acting! You see, I'm not gay! Not that there's anything wrong with that! Some in the spiritual arena of thought accept as true that they "must stop" the "gay agenda, whatever that might be. Of course, there are folks who are very obstinate in the GLBT community about certain issues such as gay marriage and they demand to be heard and are vocal on the following stage over this debate. When I read the gentleman's essay arguing that no one is born gay, I certainly understood where he was coming from, as he felt as if the ""gay agenda" had come too far, and so, he is just as adamant about pushing back now.